My proposal is that concerned Scientologists should file a lawsuit to compel CST, its Special Directors, Trustees, and Directors to take back the advanced tech and religious marks from RTC due to the damage David Miscavige has caused to the Scientology religion. David Miscavige has caused serious damage to the Church in many significant ways, particularly by the massive public exposure his physical assaults upon senior Church executives; his waste of money on paying PI’s for 25 years to spy on Pat Broeker; his numerous documented lies and falsehoods; and his Squirrel Busters operation that has arguably placed the Church’s 501(c)3 in serious jeopardy. Why is CST not acting in a way it told the IRS it could? Did CST lie to the IRS or is the CST Board merely a self-perpetuating rubber stamp for David Miscavige? The Miscavige-ordered Squirrel Busters Operation was morally reprehensible, reckless, obnoxious, unnecessary, and has proven to be destructive to the Church — and yet the Squirrel Busters have now become the global face of the Church of Scientology and of L. Ron Hubbard — and this while CST breaches it core duties of care, loyalty, and obedience as Judge Gerhard Gessell articulated in the landmark Sibley Hospital Case. And indeed, a case could be made that the rubber stamp boards of RTC and CSI are engaging in the exact same pattern. The Church of Scientology cannot have it both ways: The Church is either governed as it represented to the IRS, or, the Church of Scientology is the alter ego of David Miscavige. If the Church of Scientology is governed as it represented to the IRS, then the IJC should immediately declare David Miscavige an SP and order him off Church premises. However, if the Church of Scientology is actually the alter ego of David Miscavige then the Church should immediately lose its 501(c)3 status. 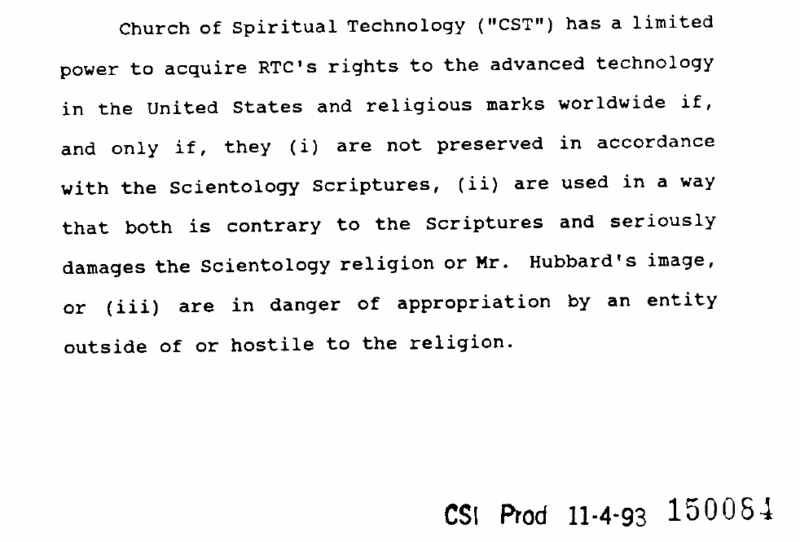 Below: The Church of Scientology’s 1992 Form 1023 submission to the IRS in support of gaining tax-exempt status. It’s a diabolically clever set up. At the core is the fact that you can find policies/scripture that are diametrically opposite of each other depending on how they are interpreted. For example, some one says ‘fundraising’ is off-policy. Then someone pulls out “the greatest good” or “using policy to stop” as the senior references. It doesn’t matter that the obvious and factual result is a collapsing Scientology with a PR value just below cancer. RTC is charged with ensuring the purity of the Tech, Miscavige can excommunicate/declare anyone he feels isn’t following policy the way that he sees it, including the Board and trustees of CST. As an aside, he also has signed but undated resignation letters from all the principals. It’s impossible for the courts to step into any sort of adjudication of what is correct interpretation of scripture thus a rebellion within CST or an external lawsuit is extremely unlikely. Other than the self inflicted slow and prolonged collapse that is happening, the only other way I see of speeding up the process is the exposure of internal documents that confirm illegal behavior, whether they are financial or criminal (e.g. kidnapping, assault, etc). Cross your fingers for a Snowden type of whistle blower emerging. The internet database about the true face of organized Scientology is priceless. Thanks for this blog and the incredible work behind it. Great points nonmom. And you are correct: The inherent contradictions in the Church’s scriptures are not problems. These contradictions instead function as an artifice to create self-serving justifications for anything. Scripture-as-artifice, as an excuse for violence. lies, and greed is practiced perfectly in the Church of Scientology. However, the law can trump scripture when laws are broken or there are demonstrable violations of public policy. My thinking is that the Special Directors, Directors, and Trustees of CST have breached their various duties and obligations to Church parishioners. One of the specific duties of CST Directors is to ensure that the Church maintains its tax-exempt status and that the image of Scientology and LRH are not harmed by the actions of RTC or CSI. But what has happened? There appears to be no oversight at all. If there had been any actual oversight, the Special Directors would have not permitted David Miscavige to run the entire Scientology enterprise so that is has effectively become his alter ego. Technically, the CST Directors can and should have reigned DM in and demanded that he function only in his legal role as COB RTC. This never happened and DM has acted in flagrant disregard of the checks and balances CSI presented to the IRS. Larry Brennan (Denise Brennan), who is eminently qualified about the corporate structure, once wrote a post along the same vein on how to legally remove Miscavige.